There will be a short meeting, followed by a Holiday Dinner and the Operation Christmas Basket Raffle Drawing in Sacramento! Due to the Business Office moving in the Spring, this will be the last Christmas meeting to be held in this building on El Centro Road. All Active & Retired are welcome to attend! Prior to the start of the regularly scheduled membership meeting of November 1st, Vice President Mitchell Newman IV gave the Oath of Obligation to thirty-seven (37) new Local 340 members consisting of the classifications JIW’s, Construction Electricians, Constructions Wiremen, System Installers, Inside Apprentices, Material Handlers, Civil Service etc.) The “swearing in” of this number of new members is becoming more of the norm rather than the exception for Local 340 and your Organizing Department (Rusty Johnston, Jillian Elliot and Rob Saragoza) want to thank you all for your consideration and support of our new Organizing methods. We have definitely witnessed a turnaround in Rank and File attitude in regards to signing up and dispatching these former unrepresented workers to jobsites throughout our jurisdiction. 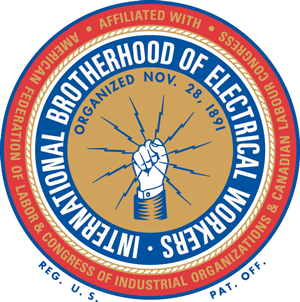 A favorite saying of our 9th District International Vice President John O’Rourke is that IBEW Brothers and Sisters need to “Extend the hand of Brotherhood”. You are doing that and more. This new thinking is helping in our efforts to continue to build an IBEW Local 340 trained workforce consisting of all classifications. With the work we see coming up in the future, we must continue to grow and with your continued help and support, we will do just that. Thanks again. The Pin Presentation officiated by Vice President Mitchell Newman IV on November 4th here at the Hall was a great success. Brother Newman was humbled by both the stories each of the retirees shared about their careers as well as by the gratitude they all expressed for the IBEW in their own words when each of these Brothers took the microphone and spoke that day. Without our retirees, none of us would have the benefits and lifestyle we all enjoy today. I want to thank Brother Newman, International Representative Michael Meals, as well as Local Recording Secretary Warren Adsit and Executive Board Members Ray Hughes and Rustin Johnston for taking the time out of their weekend to honor these retirees. I also want to thank the Business Office Staff members who showed up that Saturday to ensure the event went smoothly. Great job, everyone! I also have to thank Sacramento Central Labor Council Director Fabrizio Sasso who presented Brother Roy Ridley with a special award to acknowledge him for his well over 50 years of volunteerism. Brother Ridley worked endlessly during his electrical career (and even after retiring in 2011) to continue his passion of promoting the Union Labor Movement. Brother Ridley was quite surprised (as well as a little emotional) when Brother Sasso called him up to the stage. I know I wasn’t the only one in the crowd that day when I found myself getting choked up a bit while watching this very humble man receive an award he so richly deserved. On Tuesday October 24th, close to 50 Sound & Communication Installers and Apprentices showed up for their quarterly meeting. That was the biggest attendance in years for our S&C Unit and the members definitely took advantage of it by voicing their concerns about issues that affect them every day on the job. One of the things asked for was that we resend the Negotiations Survey via an online fillable form. That survey has been emailed to every Sound & Communications member who has a valid email address on file with us and you should be filling them out and returning them to us now in order to have your voice heard. Check your email. If you did not get the survey, call the Hall so we can research your email address and get one to you. Another request was that we invite a Trustee to your next Unit Meeting to answer Pension and Health & Welfare questions. That has also been done and in January, Brother Michael Meals will be attending your meeting. THANK YOU VETERAN’S DAY VOLUNTEERS! Speaking of volunteering, the following members took part in one of two Volunteer Projects on Veteran’s Day Weekend: Brothers Jason Green, Tim Coddington, Mark Steelman, Rob McClung, Justin Bonner, Ernest Kilpatrick and Shirish Ghandi. These projects were coordinated by our United Way Labor Liaison Brother Greg Larkins. I also understand many of our members and their families volunteered that weekend in your own communities and on behalf of IBEW Veterans everywhere, thank you. Effective with January 2017 dues, monthly membership basic dues for all Local 340 members increase by $1.00. If you self-pay your basic dues, be sure to increase your monthly payment by this amount. Also, if you haven’t done so yet, you might want to take advantage of paying online via our website. Just log on to www.ibewlocal340.org and enter your username and password. Click on “Dues” in the top left hand corner. Once you enter your credit card information, you will receive a receipt that can be printed out and the actual IBEW Official Receipt will be generated and mailed to you the very next day by the secretaries in the Business Office. OPERATION CHRISTMAS BASKET RAFFLE DRAWING 12-6-17 – Get your tickets now, or attend the December 6th Meeting/Drawing/Dinner @ 5PM at the Hall for a chance to win $1,500 cash, a shotgun or 150 Lottery Scratchers and many other prizes. You do not need to be present to win! We are again going to “bulk up” the Christmas Baskets that will be given to our members in need. Donations of food and toys are appreciated. Please bring them into the Hall before December 15TH and as always, thank you for your generosity. If you are a member in need, or know of a member who might need some help during the holidays, call Patty at the Hall. (Please note that the names of our families in need is kept very confidential.) The deadline date to have a family placed on the list for a Christmas Basket is Friday December 15th. LOCAL 340 MEMBERS & THEIR FAMILIES SAVE BIG ON THE FOLLOWING TWO FAMILY EVENTS! I mentioned this in my last two articles but it’s worth mentioning again! There are still tickets left for the Sacramento Kings vs Boston Celtics game in March. This game is going to honor all Union Labor Trades, especially those that helped to build the Golden One Arena. If interested in attending, act now. Tickets can be purchased online @ www.sacramentolabor.org/news-actions-events or by calling Teresa Villasenor @ 916-927-9772. Please note that this offer is open to all members and there are a limited supply of the discounted lower level seating tickets available. We are hoping Local 340 has a great showing of members at this game. Journeyman Inside Wireman Brother Justin Gomez (17 year member/ 43 years of age) received a kidney transplant in 2004. That kidney is failing and though the prospect of him getting a 2nd kidney donation from another sibling is very promising in the future, Brother Gomez is having to give himself dialysis twice weekly and is unable to work. He could definitely use financial help to get thru this and that’s where we all come in! There are several ways you can help! You can donate money by logging on to the following GoFundMe link: https://www.gofundme.com/4nmntwo?pc=sms_db_co2876_v1&rcid=38b7850ad086455fbdd7cd96c7df838c or you can send donations on his behalf to the Hall and we will get them to him. Please be sure to make your checks out to Justin Gomez (NOT Local 340). Another way is to attend a benefit that will be held on his behalf on Saturday December 9th from 7-11PM. A minimum $20 entry fee will get you a ton of delicious appetizers, live music and a raffle. All proceeds will go directly to Justin and I believe, he is going to try and attend if his health permits. This fundraiser will be held at Bella Bru Café, 4690 Natomas Boulevard in Natomas…just 3 miles away from the Hall! We hope to see a lot of Brother and Sisters there supporting this young man. Health & Welfare Open Enrollment runs from November 1, 2017 thru December 15, 2017. Changes to your current medical plan must be made during open enrollment. Call Teresa Raney in the Trust Fund Office @ 916-923-0666. The deadline date for changes is Friday December 15th. SACRAMENTO DECEMBER MEMBERSHIP MEETING – NOTE THE CHRISTMAS MEETING/RAFFLE/DINNER IN DECEMBER WILL BEGIN AT 5:00PM ON WEDNESDAY DECEMBER 6th – We encourage all Active and Retired members to attend this last meeting here at the Hall on El Centro Road. Next year we will be in our new building. My letter was mailed to all of you at the end of September to share news of some major changes Local 340 will be going thru in the next six months, namely we have purchased a new building and property and will be moving to Rancho Cordova. I want to thank everyone who is supporting this decision to move out of the building on El Centro Road and those who have offered to help with the move. Everything is moving along nicely with regards to our new building and once we have a solid “move-in date”, we will be sure to let all of you know. Thank you to the following members who volunteered on Labor Day at Loaves & Fishes feeding the homeless: Sister Roseanne Gilmore, Brother Jesse Naranjo, Mitchell Newman IV and Art Mendoza (who was accompanied by his daughter Jennifer Mendoza). If you missed the picnic this year, you missed a good one and we missed you. Close to 800 people showed up on September 16th at Elk Grove Park and the picnic, as always, ran like clock-work. Once again, thanks goes out to all of Local 340’s Secretaries & Agents and this year’s picnic committee members who have been working behind the scenes for the last six months planning this event. I also want to thank every member and every member’s wife, husband, partner, Mom, Dad or child, who stepped up to volunteer at the event. It was your hard work that made the picnic to go off without a hitch and ensured that everyone there had a great time. Our very generous picnic sponsors this year were: Platt Electric, United Administrative Services, Operating Engineers Federal Credit Union, West America Bank, Kaiser Permanente, LMCC/NECA, American Income Life Insurance, Winkler Forner CPA, Sierra Office Supplies, Local 340 RENEW Group and Brother Tim Coddington and his wife, Jean. The winners of the two 43” Smart HD TV’s that were donated by our LMCC were 16 year member Brother Bryan Wilfong and brand new Local 340 member Brother Prince Tarpley. Retired member Brother Tom Fox won the Corn-Hole game that had been donated by RENEW and in true “Tom Fox fashion”, he re-donated the game back to 340’s Business Office for members to enjoy at future events. Thank you Brother Fox! The kickoff for this fundraiser will be held at the October 4th Union meeting. Tickets can be purchased at the meeting, at any of our events, at the Hall or from Local Officers and Members who have signed out books of tickets to sell. Although this has been a great year again for our members, there are still Union families who struggle so your generosity to Operation Christmas Basket every year is greatly appreciated. The drawing will be held at the Sacramento Membership/Christmas Dinner Meeting on December 6th. We will also be holding our own Christmas Food and Toy Drive specifically for Local 340 families who might be having a difficult time during the Holidays. Please bring non-perishable food items and new toys into the Business Office. All donations will be distributed to Local 340 members who might need a little extra help at the Holidays. We like to “bulk up” their Christmas Baskets with your donations. Again, thank you. Be sure to attend your next regularly scheduled Unit Meeting scheduled for Tuesday October 24th @ 5PM here at the Hall. Your contract expires on November 30th and there is much to discuss. The pin presentation is scheduled for Saturday November 4th here at the Hall. Anyone wishing to show support for this years’ members who will be receiving their 50, 55, 60 and 65 year pins, is welcome to attend this luncheon. Just call Reyna at the Hall to RSVP. The Annual 340 Sportsman’s Club Raffle was a huge success this year. Thanks to everyone who donated. The winner of the Henry Lever Action .44 mag Rifle was Mrs. Joan Larson (wife of Brother Lud Larson). Joan has always supported the Local Sportmans’ Club, as well as the annual Operation Christmas Basket Raffle (which was started by Brother Larson and Brother Harry Bain over 36 years ago) so that win by Joan was well- deserved!! Apprentice Brother Glenn Young is a new daddy. His son, Glenn Allen Young V was born on August 20th and weighed in at 10lbs, 15 ounces. Update on Brother Michael Bonito: Brother Bonito’s recovery from a recent motorcycle accident is going to be a long one but he is working real hard towards his recovery. The money recently donated by Local 340 members will be specifically used at the SCI-FIT Gym which is an exercise based therapy facility specializing in Spinal Cord Injuries. Brother Bonito and his fiancé, April, are hopeful that this will enable Michael to gain even more movement in his arms soon. Again, Brother Bonito is grateful for the prayers and support he has received and welcomes call and visits from the members. Call the Hall for his contact information. Brother James Valentine – 18 year member / 74 years of age. Services for Brother Valentine will be held on Friday October 6th at the Sacramento Valley National Cemetery, 5810 Midway Road in Dixon at 11:30 AM. CIVIL SERVICE UNIT MEETING – Quarterly on the 3RD Thursdays of January, April, July & October at the Hall. NEXT CIVIL SERVICE MEETING Thursday October 19th @ 5pm! Labor Day in the United States is a holiday celebrated on the first Monday in September. It is a celebration of the American Labor Movement and dedicated to the social and economic achievements of workers. It constitutes a yearly national tribute to the many, many contributions workers have made to the strength, prosperity, and well-being of our country. There are two picnics scheduled on Labor Day and all Local 340 members and their families are invited to attend. This is a great day to mingle with members of all trades and their families to celebrate Labor and Unions. Hope you will try and make it to one of these picnics. Sacramento – Fairytale Town in William Land Park / 5:00 PM – 8:30 PM. (Sponsored by the Sacramento Central Labor Council, Labor Unions and the Building Trades). You and your family members will have full access to Fairytale Town and enjoy the free food and live music. The picnic starts at 5:00 PM and will conclude at 8:30 PM. See ad in this bulletin for more information. 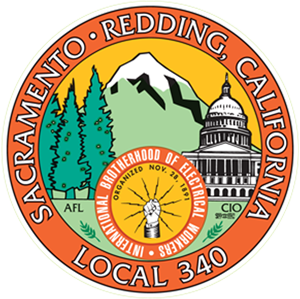 Redding – Anderson River Park / 10:00 AM – 4:00 PM (Sponsored by Five Counties Central Labor Council and the Labor Unions of Northern California) – Great Food, Live Music, Bingo, Raffle Prizes, and fishing on the Sacramento River. Contact Brother Andrew Meredith at 530-241- 2468 to get tickets and more details on this picnic. We will be raffling off four golfing spots to Rank and File members who will represent Local 340 in a foursome at the 22nd Annual Golf Tournament on Friday October 27th at Rancho Murieta Country Club. If interested in playing, come to the meeting on September 6th and enter for a chance to win a spot. All Active and Retired members are invited to enter the drawing. RSVP’s have been received and it is looking like the September 16th annual membership picnic at Elk Grove Park is going to be filled with some brand new volunteers as well as those that help every year! If you signed up for a job, you will receive an email and/or phone call with instructions as to the time and the duties of your volunteer job. Also, if you would like to donate a raffle prize to the Picnic “Members Only” Raffle, your family will be listed on our Sponsor Board as a picnic sponsor and will be displayed at the Picnic. The raffle prize should be worth at least $25.00 and must be received in the Business Office prior to Thursday September 7th. The will allow us the time to have your name printed on the sponsor board. Thank you! In the meantime, if you have any questions regarding volunteering or donating a raffle prize, contact our secretary Reyna Kwong at 916-927- 4239 or via email: rkwong@ibewlocal340.org. And don’t forget about the Picnic Horseshoe Tournament on September 15th (the evening before the Picnic) at our own Horseshoe Pits behind the Training Center. The tournament is being organized by Sister Sandi Abbott. All members are invited to play. Call the hall or email info@ibewlocal340.org to add your name to the Shoe-Players list or just show up on Friday night at 6:00 PM. Food and beverage is provided. The current 9th District Sound & Communications collective bargaining agreement expires on November 30th and negotiations have begun. If you work under this agreement, be on the lookout for a mailing/survey and please make every effort to attend your Unit Meeting on Tuesday October 24th @ 5PM here at the Hall. As per a motion made at your last meeting, a meeting notice will be mailed to all S&C members 2 weeks before the Unit Meeting, but mark your calendars now! All it takes is 5 organizing leads to put you in the raffle for a specially designed “swag bag” filled with tools and other Union made goodies. Contact Jillian Elliot at Jelliot@ibewlocal340.org with the leads or call her at 916-532-2888. All members, active and retired are invited to participate in this organizing drive. We are in the process of contacting this year’s Pin Recipients for the November Pin Presentation scheduled for Saturday November 4th. Further details of this event will be posted as we get closer to November. There are also runner up prizes, so don’t miss out. Get your tickets to win and help support your 340 Sportsmans Club!!! $5 each or 5 for $20. Call Brother Chris Tillery 916-225-4578 for more information. Tickets will be sold at the meeting. Good Luck! I had the pleasure of watching our team take the Division Championship on Friday August 11th. 340 has a very strong team and are now headed to the 9th District tournament in September. Good Luck Guys! I know you will represent us well. Brother Zackery Collins is a new Dad! His son Robert Wayne Collins was born on July 22nd and weighed in at 8 lbs 1 oz and was 20 1⁄4” long. We know Grandpa Rob is looking down on his grandson and smiling real big. Congratulations Zack and Stephanie. Brother Michael Bonito appreciates the well wishes and prayers being sent his way after his very serious motorcycle accident on Father’s Day. His recovery is going to be a long one but Brother Bonito is working real hard towards his rehabilitation. He says to keep those prayers coming! About 40 members and family members came out and marched in the Arden/Arcade 4th of July Parade. A big thanks goes out to Secretary Lyndsey Gonzales for organizing that march. We were very well received by the community and the kids loved the red/white/blue thundersticks and balloons we handed out to everyone watching the parade. We also want to thank Brother Joe Bonacorso who allowed us to store the picnic giveaways, tables and decorations at a Whittington project right across the street from Howe Avenue Park the night before the parade. It sure saved us a lot of time the next morning. Another big thanks goes out to Brothers Warren Adsit, Rob Saragoza, Eric Meredith, Nick Baldwin and Mike Franklin (and his wife, a union teacher) for manning the Union Booth at the California State Fair on Saturday July 15th. The NECA/IBEW fans we designed to keep people cool were everywhere you looked on that hot day. Brother Greg Larkins did an amazing job in setting up the Union Booth this year and it was greatly appreciated by members of all trades. This year’s Sacramento Labor Day Picnic will be held on Labor Day September 4th at Fairytale Town in William Land Park! Free to all members and their kids. There will be food and live music and the kids have complete access to Fairytale Town. The picnic will be from 5:00 PM to 8:30 PM. This is a great day to mingle with members of all trades and their families to celebrate Labor and Unions. Hope to see you there. Fliers and RSVP’s are now coming back for the September 16th annual membership picnic at Elk Grove Park. We had a great meeting and the members who attended offered and have scheduled the next meeting for 4PM on Wednesday August 30th here at the Hall. Everyone is welcome to attend the meeting, just give our secretary Reyna Kwong a call at the Business Office or email her at rkwong@ibewlocal340.org. The Picnic Horseshoe Tournament will be held at our own Horseshoe Pits behind the Training Center on the evening before the Picnic and will be organized by Sister Sandi Abbott. We schedule it the night before so that the horseshoe players can enjoy the picnic the next day with their families, as well as volunteer at the picnic. Any member, active or retired, interested in playing “shoes” on Friday Evening September 15th, call the hall or email info@ibewlocal340.org to add your name to the list or just show up on Friday night at 6:00 PM. Food and beverage is provided. Still looking for those leads! If you know of any electricians or electrical contractors that we could talk to, be sure and get those leads to us. If you notice jobs going up in your communities, call us. For any 5 leads you provide, you will be entered into a monthly drawing to get some nice Union Swag. Contact Jillian Elliot at Jelliot@ibewlocal340.org with the leads or call her at 916-532-2888. All members, active and retired are invited to participate in this organizing drive. Remember, as Union members, we are all organizers and your help is needed and welcomed! Thank you. The next Pin Presentation for members receiving 50+ years of service pins and certificates will be held on Saturday November 4th. Look for further details of this event in the future. In the meantime, congratulations to the following 39 members who will receive pins this year. 50 years: Thomas Becker, Dwight Evans, Ronald Jarnagin, John Jeffcoat, Stephen Mulherron, Roy Ridley Jr., Michael Riordan, Dave Sittman. 55 years of service: Dan Briggs, Talmage Burnett, Ronald Derobertuis, Craig Gildart, Gary Grosse, Tom Melavic, Thomas Murry, William Myre, Ira Sharp, Jim Strain and Keith Williams. 60 years: Clifton Cox, Lewis Crockett, Marcus DelRincon, Eugene Fischer, Robert Frank, Robert Furniss, Delbert Garner, Richard Hall, Gerald Harwood, Gary McDowell, Larry Partanen, Waldemar Peppel, Joseph Quintana, Robert Watkins, Wendell White. 65 years: Ray Kercher, Edgar Patton, Gilford Sisk, Donald Smith, Clyde Treece. Joint Executive Committees Meeting / New Date! Notices have been mailed and emailed to all Committee and Trust members for the next mandatory Joint Executive Committees Meeting. the meeting will be held on Saturday August 5, from 8-Noon at the Hall. If you haven’t purchased your tickets for the annual Sportsman’s Club Raffle, you still have time. The drawing will be held at the September 6th membership meeting. Purchase them at the Union Meetings, at the Business Office or from a member of the Sportsman’s Club. Brother Bill Delgado has a beautiful new baby boy. Nicodemus Vicente Delgado was born on July 18th and weighed it at 8lbs 5oz. Mom Leti and baby are doing great. Brother Michael Bonito was in a very serious motorcycle accident on Father’s Day. He has been moved to a physical Rehab facility in the Bay Area. Is able to communicate well but is unable to move lower extremities except for one arm. He is very positive that he will recover from his injuries and appreciates the prayers and positive thoughts. JATC Instructor Matthew Nootenboom is currently undergoing chemotherapy treatment but has returned to work at the JATC for the summer and seems to be doing well, although a bit tired. Very appreciative of everyone’s prayers and thoughts. Bill Vice is slowly but surely healing from his New Year’s Eve accident when he broke his back and appreciates all of the prayers and positive vibes coming his way. He doesn’t think he will be managing the sodas and waters at this year’s picnic, however, so if anyone can take over for him, he would greatly appreciate it. Brother Ron Manas has passed away. He was a 56 year member and 79 years of age. We are currently working on updating and proofing the Inside Wiremans’ Agreement per the recent CIR decision. The process of retyping this 42 page document to incorporate all of the revisions that were agreed upon takes quite a while and must be proofed word for word several times before it is complete. Once the typing and proofing is done, the agreement will be mailed to our International Office for final approval. When the final approval is received, we will get it to the printers and your copy of the 2017-2021 Inside Wireman’s Agreement along with wage sheets will be mailed to you. The 35% and 40% Apprentice increases went into effect on June 1st. The next raise that will impact all members will be August 1, 2017.
and watching our players play on the same court as the Sacramento Kings. A special thanks goes out to Sound & Communication Installer Brother Michael Watts who volunteered to MC the game for us and did an outstanding job acknowledging all of the players and calling the plays. This new Local 340 basketball team was put together specifically for the opportunity to play at the Arena, but when Elite Power offered to sponsor them and pay for jerseys, equipment and league fees, the decision was made to continue honing their skills as a team. Hopefully, they will have another opportunity to play at the Arena next year. Our Mens Softball League is playing now on Fridays at Rusch Park in Citrus Heights. The remaining games for this season are as follows. These family friendly Friday games are a lot of fun to watch so come out and cheer them on! Hope you will join us on Tuesday July 4th when we Local 340 marches in the Arden Arcade parade. We are meeting at 8:30 AM at 2700 Fulton Avenue to begin the march and will wind up at Howe Avenue Park for a BBQ! If you need more information, contact our Secretary Lindsey Gonzales at 916-927-4239. Don’t forget! Saturday July 15th is Local 340’s day to man the Union Booth at the California State Fair. Stop by the Union Booth for your “freebies” and introduce yourself to the Brothers and Sisters who are volunteering their time to get out our message that the IBEW is about all working family values. Members providing 5 or more viable leads to our Organizing Department will have a chance to win Bags of Union Swag! Provide us with names of Jobsite Locations, Non-Union contractors in your area, and/or contact information of non-represented electricians and receive a chance for our monthly drawing! Contact Jillian Elliot at Jelliot@ibewlocal340.org with the leads or call her at 916-532-2888. All members, active and retired are invited to participate in this organizing drive. Remember, as Union members, we are all organizers. Thank you. 50 years of service: Thomas Becker, Dwight Evans, Ronald Jarnagin, John Jeffcoat, Stephen Mulherron, Roy Ridley Jr., Michael Riordan, Dave Sittman. Clifton Cox, Lewis Crockett, Marcus DelRincon, Eugene Fischer, Robert Frank, Robert Furniss, Delbert Garner, Richard Hall, Gerald Harwood, Gary McDowell, Larry Partanen, Waldemar Peppel, Joseph Quintana, Robert Watkins, Wendell White. 65 years of service: Ray Kercher, Edgar Patton, Gilford Sisk, Donald Smith, Clyde Treece. has been scheduled for Saturday August 5, from 8-Noon at the Hall. Notices will be mailed in advance to committee members but please mark your calendars now to attend this meeting. There is a lot to discuss. Tickets are now available for the annual Sportsman’s Club Raffle. Prizes are: a Henry Rifle, Rod & Reel, Shotgun, specially designed IBEW knife and much, much more. Drawing will be held at the September 6th membership meeting. Tickets are $5.00 each or 5 for $20.00. Purchase them at the Union Meetings, at the Business Office or from a member of the Sportsman’s Club. Fliers and RSVP’s will be mailed out in the next few weeks for our annual membership picnic scheduled for Saturday September 16th at Elk Grove Park. If you are interested in getting more involved in the picnic this year as a volunteer, please call Reyna or email her at rkwong@ibewlocal340.org. This is the 3rd year that a specially designed picnic mug will be given to all of our member volunteers. Brother Richard Adams – 46 year member / 89 years of age. CIVIL SERVICE UNIT MEETING – Quarterly on the 3RD Thursdays of January, April, July & October at the Hall. NEXT CIVIL SERVICE MEETING Thursday July 20th @ 5pm!